The huge hangars were 160 feet high, 1000+ feet long and 270 feet wide and built from Oregon of Oregon Douglas fir. 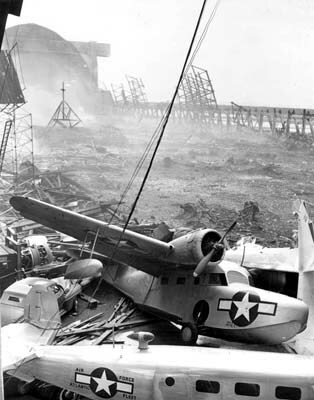 The hangars, 313 military aircraft and 153 civilian aircraft stored inside, along with numerous government and private automobiles, were destroyed by wind forces and a fire during the hurricane that hit south Dade County on September 15, 1945. I would like to find if veterans are alive that served at the The Richmond Naval Lighter than Air. My dad served there from 1943-45 when it was destroyed. He is 90 and would like to find others.